I recently ran a sales workshop for lawyers from a successful Chicago firm. One of the attorneys said, “I have a hard time explaining what I do. It’s pretty technical, and by the time I finish describing it I’ve usually confused the person.” In response, a more senior lawyer, who also happens to be one of the biggest ‘rainmakers’ at the firm, said, “If someone asks me what I do, I just say that I’m a lawyer. I don’t offer any details. Then, they usually ask me to tell them more. At that point, they’re interested, so I can give them some more information.” The Second City Almanac of Improvisation says “the more you tell the audience, the less they can imagine.” (page 160) This is a wonderful maxim for sales and marketing. Brochures stuffed with copy, hour-long fact-filled presentations, massive PowerPoint decks … they’re all based on the idea that the job of sales and marketing is to explain a story to customers. But explaining a story is usually not best the best way to communicate that story. In order to communicate successfully, it is important for the customer to become engaged in the story, and a monologue won’t engage her. A dialogue in which she participates has a much better chance of engaging her and creating successful communication. Resist the temptation to explain. Remember that your customer isn’t all that interested in your story, and so a detailed explanation is likely to lose her attention. Make it easy for her to participate in the conversation. View your sales and marketing interactions not as opportunities to explain your story but as opportunities to engage your customers deeper. Don’t over explain … and give your customers a chance to imagine. This video is a great satire on the world of brute force branding. It's from Geert Desager of bringtheloveback.com. Imagine you are at a party, and you see someone with whom you are acquainted. You and this person don't know each other well, but whenever you run into each other, you enjoy talking. You're enjoying the conversation when, suddenly, you notice the conversation has taken a new course. The other person is pitching you, trying to sell you something. Subconsciously, you take a step backwards. Your shoulders tense a bit as you automatically take a defensive posture. What could he have done differently, enabling him to transition the conversation to a sales conversation without causing you to have this response? After all, maybe he's selling something you want to buy; how could he have gotten you interested by taking a different approach? Reverse roles and imagine you are the salesperson. You are in a conversation with someone who might be a social acquaintance of yours, a business prospect or even a long-term customer. As the conversation unfolds, you see that this person could really benefit from something you are offering. How do you move in the direction of a sales conversation without alienating this person? A recent issue of this newsletter was titled The #1 Sales Rule: Don't Talk About Yourself. This concept may seem counter-intuitive, but not talking about yourself is one of the key ingredients to a successful sales conversation. A great sales conversation is primarily a conversation about the customer, not about the salesperson and his offerings. This holds the customer's interest. The art of a great sales conversation is to integrate, at the appropriate time and in appropriate ways, components of the salesperson's offerings into the conversation, while still maintaining the customer as the main subject of the conversation. Integrating your offerings into the conversation must be done very gently and judiciously. Imagine you are in a conversation with someone, and you would like to sell this person something. You are asking questions, but the conversation is not yet moving in the direction of a sale. Let's now look at how you make the "gentle turn" from not selling to selling, while maintaining a conversation about the other person. If you follow these principles, your customer will be more likely to start seeing how you can work together. He will start buying, without you having to resort to the vain pleas of a sales pitch. However, if you turn too abruptly from conversation and start pitching (the image of the "Bat-turn" from the '60s TV show Bat Man comes to mind), you'll lose your customer. The turn must be gentle. And here's the next caution: Once you make the gentle turn, there's a good chance that your customer will show interest in what you have to say. Resist the tempation to launch into a pitch! The customer's interest will be a sign of willingness to keep the conversation moving forward, not a willingness to hear you monologue. Have a look at this issue, Time for a break (The one-paragraph rule), for ideas on how to protect yourself from poisoning the progress you've made up to this point in the conversation. One challenge of ditching the pitch is to create a sales conversation that actually turns into sales. The successful -- and gentle -- turn from not selling to selling is one of the keys to selling effectively. Read the newsletter: "The Gentle Turn: From Not Selling to Selling"
A CEO attending one of my workshops recently gave this reason for not focusing his team on business strategy development: "We’re too busy executing to spend time on strategy." This statement raised my eyebrows. I asked the CEO to tell me more. "My people are working really hard, and they are always complaining that they have too much to do, and too little time. We have so many initiatives underway that we can't afford to look up into the clouds and discuss 50,000-foot strategies. We have to keep working." I have a strong hunch why the CEO's people are so busy. With no strategy to guide them, every idea looks like a good idea, and there are few filters for determining what to do -- and what not to do. Without strategy, opinion, precedent and guesswork are the only criteria for deciding where to spend time and resources, and this leads to spending time and resources on many activities of little or no value. Business strategy doesn't only operate at 50,000 feet. Good strategy also serves as a guide to help companies make decisions about ground level, day-to-day execution. What business results should we not strive for? You don't have the resources to create all possible business outcomes, so you need to focus on those that are most important. For example, don't focus efforts on small, unprofitable product lines if they are distracting you from a focus on other things that can contribute more to your success. Which customers should we ignore? Knowing who your customers should be is important, and so is knowing who your customers shouldn't be. An example: Many professional service firms (lawyers, accountants, financial advisors) tell me they want bigger clients but, upon reflection, realize that bigger clients aren't necessarily more profitable clients. Good strategy could help these firms avoid wasting resources on clients that seem desirable, but really aren't. What shouldn't we tell our customers? Your customers can only absorb so much information about your company and its products and services. Restrain yourself! Chop off the bottom five bullet points and communicate a much more concise, understandable story. Which marketing communications should we avoid? Most marketing communications don’t work. Don't create communications just because you did the same thing last year, or because your competitors are using a certain medium. Let your business strategies help you choose the right media to reach your most important customers and drive your most important business outcomes. We all have limited resources. Creating a to-don't list, with the help of solid strategic thinking, is one of the best ways to allocate these limited resources in the most productive ways. How do you convince customers to buy from you? With sell sheets? PowerPoint decks? Explanations of new product features? Hardly. To lead your customer to a thoughtful decision where they choose you over the competition, you need to help them form compelling beliefs about why you are the best choice. Your customers don’t form these beliefs just by listening to you talk, or by reading your marketing materials. You’ll be much more successful if you look at the customer’s entire purchase decision process as a conversation between you and them. Imagine that, over the course of a sale, you and your customer were engaged in an ongoing conversation that had the characteristics listed above. Even if that sale takes many months and many meetings, it would be a powerful experience for your customer. Imagine that while your competitors were presenting PowerPoint decks and sell sheets to a customer, you and the same customer were creating this kind of conversation. This approach will make you (and your products) more memorable and meaningful to your customer. When you reconnect with a good friend, after not seeing them for a few weeks, you are able to pick up right where you left off. You and your friends have a series of ongoing conversations that continue from one meeting to the next. These ongoing conversations form the fabric of your friendship by adding both continuity and shared experiences to your relationship. Imagine that, over the course of a sale, you and your customer formed an ongoing conversation that added continuity and shared experiences to your customer’s decision-making process. Wouldn’t that increase your chances of making the sale? A sale is the result of a great, ongoing conversation. Remember this. Practice this. You will improve your sales while building lasting, loyal, and profitable relationships with your customers. Humans respond to spoken language and written language differently. So, ditch your PowerPoint when selling! Spoken language encourages your customer to think, interact and converse with you. Talk with customers. Don't read to them. Watch the video: Persuade with the Power of Spoken Language I was inspired to produce this video after taking Professor John McWhorter's class "The Story of Human Language" from The Great Courses. You should check it out! Do you have an elevator pitch? It's that 30-second, well-crafted self-description you would deliver if you found yourself on an elevator with an important, prospective customer. If you have an elevator pitch, tear it up into little pieces. But don't throw those little pieces away. Your elevator pitch has lots of valuable pieces in it, and you don't want to lose them. But when those pieces are combined together, they can turn into something that is long, boring and unmemorable. You're much better off thinking of the pieces of your elevator pitch as tools that you can use at appropriate times during conversations with customers. When you look at the individual pieces of your elevator pitch, notice how each one of them can be developed into an interesting idea. Isn't there more to each piece than the short phrase allotted in your elevator pitch? For example, let's say you sell machinery that uses leading-edge technology, decreases your customers' production cycle times, and offers a 99.9% uptime guarantee. If you're talking to a prospect and you realize that uptime is a major issue for him, wouldn't you be better off having a deep discussion about uptime rather than just mentioning it as part of a well-crafted 30-second monologue? (And, by the way, if you were just delivering your elevator pitch, and not listening, you would not have learned that uptime is a major issue for him.) Now, notice how the different pieces of your elevator pitch connect to each other. Can you diagram their inter-relationships? Could you have a rich conversation with a customer on any of these connections? For example, maybe your elevator pitch includes one phrase that refers to your team's expertise, and another that refers to how you help your clients anticipate market needs. Could you hold a deep, meaningful, 10-minute conversation with a prospective customer about the connection between your team's expertise and this ability to anticipate market needs? That conversation would last 20 times longer than a 30-second elevator pitch, and would focus on only two of the elements of the pitch. And, most importantly, it wouldn't be a pitch. Nobody wants to hear your sales pitch. I don't care how amazing you are, how unique your product offering is or how much better you are than your competitors; nobody wants to hear your pitch. If you launch into your elevator pitch, your customer will tune out well before you're finished. He'll start thinking of his next appointment; he'll look for his car keys in his coat pocket, and he'll make a mental note to call his assistant to check on something, all while your mellifluous adjectives and well-turned phrases bounce off the elevator's walls, unnoticed by anyone but you. Instead, think of how to have a 30-second elevator conversation, in which you engage your customer and judiciously bring in pieces of your elevator pitch at appropriate times. This means that you can't tell your entire story during this short meeting, but that's okay. Your objective is not to close the sale, but to earn the right to have another conversation. At the end of the elevator ride, you want the prospect to have enough interest that he's willing to agree to that follow-up conversation. Maybe your follow-up conversation will happen in the building lobby, after the elevator doors open, or maybe it will be a phone call you schedule for the next day. During the follow-up conversation, you'll be able to weave in more pieces of your elevator pitch, and, as your relationship develops over subsequent conversations, your new customer will begin to form a rich story about you in his mind. What has a better chance of earning you a follow-up conversation- a 30-second monologue in which you deliver every piece of your elevator pitch, or a 30-second conversation in which your prospective customer becomes intrigued by one thing he learns about you? Don't lose sight of your goal in a first, chance meeting with a potential customer. Whether this meeting happens in an elevator, at your cousin's kid's wedding or in an exit row of an American Airlines 757, your real objective is to create a reason for a follow-up. If you want customers to understand what you do and how you can help them, tear up your elevator pitch and weave its pieces into relationship-building encounters with your customers. That way, people may actually hear what you have to say. The movie, 50 First Dates, starring Drew Barrymore and Adam Sandler, is billed as a romantic comedy. But I see it as a business movie. In the film, Sandler's character, Henry, and Barrymore's character, Lucy, meet one day and have a great time. However, the next day Lucy doesn't remember Henry, due to a memory problem that erases the previous day's memories each night. So, their relationship has to start anew each day. This is just what it's like to do business with most companies. Aren't there stores in which you've shopped for years, that still greet you with an impersonal, "May I help you?" as if you're entering for the first time? How many restaurants remember that you don't like pickles on your burger, from one visit to the next? Why do I need to repeat my customer service problem to successive AT&T operators? So many things that seem outlandish in real life, such as a person not remembering yesterday, are taken for granted in business. More convinced than ever: The best business practices reflect the basic truths of everyday life. Don't you just hate it when people take 723% longer to say something in a meeting than is necessary? They start their update with a rambling description of the main idea, throw in sub-points, try to weave in tangents but only create verbal knots, repeat themselves, repeat themselves again, lead up to a seeming denouement, repeat themselves again, stall with a verbal ellipsis, repeat one of the points yet another time, resist the final puncutation, add in another thought, finally dribbling off as everyone in the room catches themselves daydreaming about what must have entered their BlackBerry's during this screed. Just finished a wonderful book, Team of Rivals, by Doris Kearns Goodwin. The book focuses on how Abraham Lincoln built his cabinet. Instead of choosing cronies and old pals, Lincoln’s choices included three of his major rivals for the 1860 presidential nomination, William Seward, Edward Bates and Salmon Chase. None of these men thought Lincoln was presidential material, and, in fact, he was considered a light-weight who was not prepared for the job. Lincoln won them over – especially Seward – by genuinely and methodically building his relationships with them. In fact, relationship-building encounters were a key to Lincoln’s success, whether it was at the highest political echelons or meeting the troops at the front. (Chase was the toughest relationship in the cabinet for Lincoln, but that was due more to Chase's awkwardness with personal relationships than it was to anything Lincoln did.) What’s especially interesting is that Lincoln was very successful at building relationships from afar, through letters and telegrams. I’m often asked, in speeches and workshops, if the proliferation of electronic communications – text messages, emails, instant messages, etc. – are making it harder for us to have human encounters. The truth is that it’s now easier to connect with people who aren’t nearby. Sure, electronic communication can be a crutch, but people can respond immediately to text messages, and you can instantly be in a dialogue with someone a continent away just by dialing their cell phone. And, of course, air travel makes it possible for us to include more in-person encounters in our relationships than was possible mid-nineteenth century. We can learn from Mr. Lincoln. Every interaction can be a relationship-building encounter, if we genuinely believe that relationship building is at the center of what we need and want to do. A customer is anyone who affects your results. So, anyone can be a customer. What makes marketing good or bad? To answer this question, let's first address a more fundamental question: What is marketing? Here's my definition of marketing: Marketing includes all activities an organization produces that influence customers to behave in ways that affect the organization's business results. This definition is based on the following section of the Brand Harmony Results Model: As the model shows, from right to left, your business results are impacted by the actions your customers take. Customer action is driven by the kinds of beliefs customers have about you. Your customers' beliefs about you are determined by all interactions customers have with your company. Every interaction a customer has with your company that can influence customer beliefs and actions, and therefore affect business results, is part of your marketing. Marketing is not just the product of your marketing department; it can include anything your company does that affects the experiences customers have with you. This definition of marketing has a very important implication: It is customers, not marketing people, who decide what a company's marketing is. If customers are influenced by it, it's marketing. Marketing professionals may bristle at this, because it downplays the significance of their lofty art. Sorry, if anyone is bristling, but that's just the point. When you look at what really influences customers to act, in most cases, it is not the product of marketing departments. Customers' attitudes are highly influenced by product and service experiences, interactions with a company's employees, logistics of doing business with the company, etc. Be sure that your marketing focus includes all the touchpoints a company has with its customers, in order to focus on what really makes a difference. Now we can return to our original question: What makes marketing good or bad? Here's the answer: What makes a marketing effort good or bad is the extent to which it impacts the business results of the company, product or service being marketed. It's that simple. Good marketing has a positive effect on business results, and bad marketing has a negative effect or no effect on business results. Every other measure of a marketing effort's quality, such as "we reached 3 million people," "we really stood out from the competition," and "we built awareness" is a secondary measure that only counts if it eventually leads to business results. It doesn't matter how many people you reach, or how many people know about you if it doesn't lead to improving the state of your business. What this means: Don't evaluate your marketing by how great the ad creative is, or how flashy the website is, or how clever your Facebook posts are. The only measure of whether your marketing is good or bad is how well it encourages customers to act in ways that improve your business results. If the accounting department comes up with a new payment policy that leads to increased repeat purchases from customers, and the marketing department comes up with a new social media program that doesn't drive business results, then you need to accept this truth: Your accounting department has done better marketing than your marketing department. What if you can't measure those results? Hold on to your seats, because I'm about to share an important principle that is not intuitive: Good marketing can produce results that can't be measured. You've all heard the adage "if you can’t measure it, it's not worth doing." It's not true. There are many things you can't directly measure, but you know they are good for your business. An example: Can you measure the ROI on having your receptionist smile at guests? Do you believe that it is better that she smiles than if she snarls? The receptionist's smile, like many other customer touchpoints, contributes to better business results because customer beliefs about your company are formed by the way many different touchpoints blend in brand harmony to communicate one clear, integrated story about your company and/or its products and services. Good marketing becomes great marketing when every point of contact your company has with customers blends with every other point of contact to create a wonderfully integrated customer experience that encourages customers to act in ways that drive your results. In summary, marketing includes all activities an organization produces that influence customers to behave in ways that affect the organization's business results. And when those activities lead to improved business results, you have produced great marketing. How do you convince customers to buy from you? With sell sheets? PowerPoint decks? Explanations of new product features? Hardly. How do you lead your customer to make the decision to choose you over the competition? You need to help your customers develop compelling beliefs about why you are the best choice. Your customers don’t form these beliefs just by listening to you talk, or by reading your marketing materials. You’ll be much more successful if you look at the customer’s entire purchase process as a conversation between the two of you. Imagine that, over the course of a sale, you and your customer were engaged in an ongoing conversation that had the characteristics listed above. Even if that sale takes more time and involves more meetings, it would be a powerful, compelling experience for your customer. Imagine that while your competitors were presenting PowerPoint decks and sell sheets to a customer, you and that same customer were creating this kind of conversation. This approach will without a doubt make you (and your products) more memorable and more meaningful to your customer. When you reconnect with a good friend, after not seeing them for a few weeks, you are able to pick up right where you left off. You and your friends have a series of ongoing conversations that continue from one meeting to the next. These ongoing conversations form the fabric of your friendship by adding both continuity and shared experiences to your relationship. Imagine that, over the course of a sale, you and your customer formed an ongoing conversation that added continuity and shared experiences to your customer’s decision-making process. Wouldn’t that increase your chances of making the sale? A sale is the result of a great, ongoing conversation. Practice this. You will improve your sales while building lasting, committed, and profitable relationships with your customers. Dealing with ambiguity ... one of the key traits of both leaders and recalibrators. It's not that you can't be thinking while you are talking. Of course you are. But are your thoughts directed into the conversation, or are they part of a competing, plotting, inner monologue? Does the other person have a second voice in his head, hidden from you yet obscuring the true meaning of what you hear him say? This is the intersection between being fully present and conversation. If you are talking to yourself, you can't be in true dialogue with another person. Recently, I interviewed with Erik Hansen of the Tom Peters site as a Cool Friend. The interview was really long, and I know you all have lots of things to do, so I broke it up into byte-size pieces. There are two interview clips in this divShare box. In the first piece, Erik and I talk about what makes a We relationship. In the second, Erik and I discuss how marketers lose their sense of real-life relationships when they start "targeting" their customers. If you'd like to hear or read the entire interview, you can find it here. Entropy is one of the most powerful forces in the universe. It is the tendency for systems to move from states of order to states of disorder. Line up all of the toys on a child's shelf, and soon they will end up scattered all over the floor. Clean up your to-do list, and by the end of the week you will need to re-organize yourself. It's easy to see why entropy is so powerful when you consider that the ordered state is only one of millions of possibilities for the system; disorder is much more probable than order. Entropy can dilute your customer experience, if you do not have a strong brand essence that acts as a glue to hold together all of the elements of the experience. The reason for this is simple - there are thousands of different ways a particular customer interaction can happen, but only a few of these possibilities will reinforce your brand story and add to the sense of Brand Harmony that your customers perceive. Consider a very simple example. You own a athletic shoe store, and you believe that you can differentiate your store by asking a customer to describe his personal exercise habits, and the aches and pains he gets from exercise, in order to find the perfect pair of shoes to fit his needs. Your website and in-store signage describe this brand promise, and you, personally, deliver this promise when you wait on customers. Now, think about what happens when another employee serves a customer. The "right" ways to interact with a customer make up only an infinitesimal portion of the possible ways to interact with a customer. So, if this employee doesn't have a strong sense of your brand promise, and doesn't feel the essence of the brand in her bones, it is highly likely that she will not support the brand when she interacts with customer. The result: It is more likely that a customer interaction will dilute your brand promise than it is likely that it will support your brand promise. Brand entropy is more likely than brand reinforcement. If you want a strong brand, you need to be one of the (few) companies who define their brand essence with great richness and detail, and ensure that everyone who works in the company understands the promise, with equal richness and detail. This takes a lot of effort, but, then again, entropy is one of the most powerful forces in the universe. 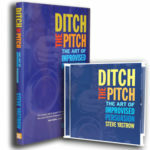 Hope you enjoy Ditch the Pitch! Sales and marketing are not about telling stories. Sales and marketing are about helping your customer create a story, in his mind, in which you figure as a prominent, clear, vibrant character. If your customer tells himself a meaningful, motivating story that includes you, he will be much more likely to get more involved with you, and take actions that improve your business results. Stop telling stories about yourself. Instead, figure out how to make yourself part of your customer’s story. Throughout July, and now as August is starting, I've found myself in conversations with many clients about the second half of 2015. "We're down a bit from 2014, but the second half of the year is usually stronger so maybe we can make up the difference." "We're having our best year ever. I just hope we can keep up this pace." "We've just launched a new product, and it if it launches well it can really help make 2015 a great year." At Yastrow and Company, we're in a similar position. We are having a great year, and we're very focused on maintaining our momentum for the balance of the year. What kinds of things should we all be thinking of to make the second half of 2015 a success? Identifying the most lucrative results will help you direct your efforts and scarce resources in a direction that can have the most impact on your 2015 results. Who are the customers that can help you achieve your results? You don't create your business results. Your customers do. For you to have a successful second half of 2015, you need to motivate customers to act. For example, your ability to generate results depends on encouraging customers to meet with you, share information with you, consider your proposals and offers, buy from you, buy more from you, pay your bills, refer you to others, etc. Knowing who your most important customers are, and what you want them to do, can help you focus your sales, marketing and customer service activities on motivating the customer actions that can most impact your results. Let this be the guide for all customer communication-- focus less on "getting the word out" to the marketplace, and more on motivating your most important customers to act in ways that will help you make 2015 a winning year. As 2016 approaches, you'll naturally start evaluating your success again, so allocate a reasonable amount of attention and effort to longer-term issues. What you will find is that many of the issues you will need to focus on in early 2016 are continuations of the issues you need to focus on in the second half of 2015, so rest assured that a concentration on near-term issues does not sacrifice the future. In fact, you'll be even more ready for 2016 if you finish up 2015 strong. I have so many ideas, and so many people I want to meet with. If I don't focus my attention, it could be easy for me to spread myself a mile wide and an inch deep. Don't do it! Say no to activities and requests that don't fit the process described above. It's difficult, but by keeping your "eye on the prize" of a strong 2015, you'll be much more likely to keep yourself, and your company, focused.